As discussed a couple of posts ago, our small gaming group is still searching about for a Napoleonic ruleset. There are 3 of us and we try to game monthly (well maybe that is a bit hopeful) in Montreal. Our gaming time is somewhat limited because I live in Massachusetts, but we all do our best. I believe Iannick and Nicolas are relatively well known to the readers of this blog and sometimes Iannick's brother Gabriel makes a fourth. We have not been completely satisfied with our gaming experiences to date so we decided to start a search for a new set of rules. Our plan is to test 3 new sets, with each of us being responsible for working out one set of rules and being the non playing games master. We have selected 3 rulesets to try Rank & File from Mark Simms, General de Brigade from David Brown and Shako II from Artie Connick. I have collected multiple rulesets over the last 5 years including Black Powder, Piquet, Piquet Field of Battle, Le Feu Sacre, Republic to Empire, Lasalle, Napoleon, Warhammer Waterloo, Shako II, General de Brigade, March Attack, Fast Play Grande Armee and Field of Glory Napoleonics. A lot of rulesets! As noted previously we as a group have played Black Powder and Field of Battle and I have a personal acquaintance with Le Feu Sacre, Lasalle, Republic to Empire, Waterloo and Field of Glory Napoleonics. I am unsure what Iannick or Nicolas played prior to us meeting up. Well I purchased Rank & File 3 years ago and unfortunately it sort of got lost in the number of new rulesets that came out at the same time. Well a couple of months ago it got dusted off and I had a look. What I saw I liked so I decided to have a close look and selected it as my choice to present to the group. Written for the horse and musket era, little Napoleonic chrome, no info on national characteristics in book. Stand based: each unit is comprised of 4-9 stands, except artillery. Moving ADC's to change orders. Casualty is stand removal but can use markers. Casualty test for attached commanders when stand is lost. Sequence is simultaneous except for movement which you dice for each turn. All the usual Napoleonic formations. This is the real beauty for me of the rules, as it is done exactly the same for firing and melee and it is one step with no saving throw. So each unit is comprised of a number of bases: Meleeing and firing units count the number of bases in contact or in range and throw that number of D6's. To hit is 4, but is modified by in 1 table for each type of combat. 3 hits you remove a stand and voila....c'est ça. Melee is resolved in one turn, one side retires unsteady or routed. Different value depending on unit class. Is tested after stand loss from a single simple table using single D6. Rally is based on same table. Failure of test changes condition of unit. It has a somewhat weak command and control. Our units are on the small side in respect to infantry and cavalry (ours being 4 and 6 stands) but being on the large side for artillery (ours being 3 and 4 stands). The ruleset has skirmishers as battalions rather then companies. I decided though that this was OK, I may be wrong but I believe it simpler to add rather then subtract. Before I started checking the rules I got some clarifications from the rules writer Mark Simms on the Crusader Publishing Forum. There is not a whole lot of activity there but Mark appears to check the forum daily and has been very helpful in clarifying some of the rules (really not much help needed) but also offered some solutions to some of my concerns listed above. Once educated, I have started to test the rules with a couple of units per side, really they are quite nice and easy to play. I have now almost completed a playtest of the rules using a brigade aside. I had planned to put the play test in this post but it is quite long already, so I will post it in a couple of days. I have found that my playtests of rulesets have been the most read posts on my blog and I really like to take my time with them. You can play it with either, the stands can represent 50, 100, or 200 men. The only real thing this effects is the number of artillery stands you would use for a battery. The stands in an infantry unit could be anywhere from 4-9. 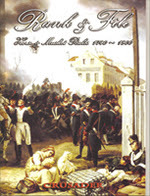 There is in fact a specific Napoleonic ruleset by Crusader, called March Attack (http://www.crusaderpublishing.com/MarchAttack.php). In the ACW supplement to Rank & File there is IIRC an expansion on the C&C system. Thank you Salvador, I actually have March Attack, nice ruleset, but I believe aimed at larger action with two base battalions. Maybe not exactly what I am looking for. Very nice run through of the rules.